Welcome To My DiD/DML Hand/Head Swop Page. This page is one that I have meant to do for ages, but I have only just remembered about it after having to about change both a pair of hands and a DiD head. I can't recall where I learned this from, but I must have been from a clever person somewhere. As with a lot of the kitbashes I have made recently, the headsculpts that I prefer to use a lot of the time are the DiD one's, combined with a thinner Dragon Neo 2 type of body. But the problem in doing this is that I have to convert the DiD head to fit the Dragon body frame. 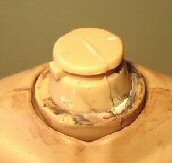 Note: To remove a head from a body, I have found that if I put the moulded head into a cup of hot water for about a minute, it helps to get the head off the neck mounting. Also, once it is off leave it aside for a coupe of minutes to cool down, that way there should be no distortion or damage to the head. Important Note: Do NOT use the hot water with the DiD hairy heads, as I have found that the water causes the hair to fall out, because it removes the glue. 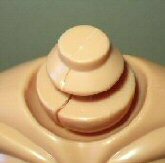 Instead try using a hairdryer, to warm these heads up at the neck joint to loosen them enough to remove them. 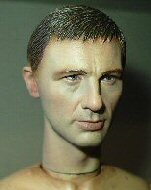 In the pictures above I have shown how to convert the DiD head. The first picture above left is the inside of a standard Dragon head, the next picture is of the inside of a standard DiD head. The next two pictures show a Dragon neck mounting along with a DiD neck mounting, and as you can see the DiD head will not fit onto the Dragon neck mount. So to combine the two, I have had to use my model knife to carefully cut away the inside of the DiD head, so that it will fit tightly onto the Dragon neck mounting. 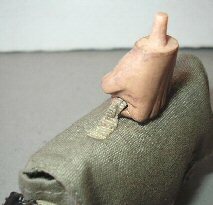 Note: This has to be done very carefully and slowly, removing a little at a time to widen the hole in the neck, making sure that you check that the head will gradually fit onto the Dragon neck post. In the last picture above right, I have the DiD head mounted onto the Dragon body, which if done right will be a tight fit as the head and neck joint closes up when you push the head into place. 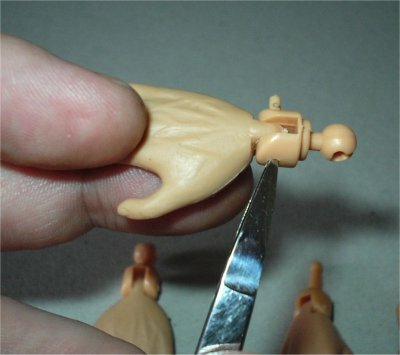 The process is quite simple, as all you have to do is remove the pins from each wrist joint on the figures. Note: Making sure that you keep each pair of pins apart. 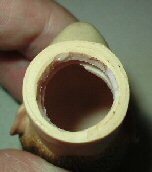 As I have found that they are different sizes (diameters), and if they get mixed up it can cause problems putting them back together again. 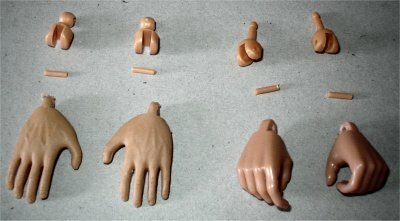 These are the pairs of hands in the picture, the DiD hands on the left and the DML one's on the right. 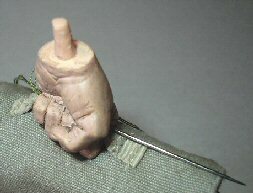 In the picture below, I am removing the pin from the wrist joint on the DiD hand. This is just a case of using a pointed object like tweezers to push out the pin. In the next picture below right, I have removed all of the pins and separated all of the parts. As I have said above make sure that you don't get the pins mixed up, as you can just see that the DML one's are slightly bigger. 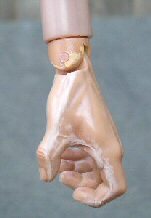 The picture below left shows the DML hand being inserted into the DiD wrist joint Note: Sometimes I have found that I have to trim the middle part of the hand down on the side. As it may be too tight to fit into the DiD part. 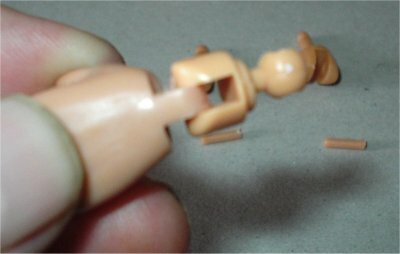 The next pair of pictures show the DiD pin being put back into place. 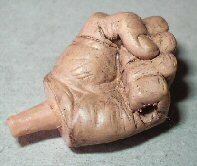 You also may have to wriggle the hand to get the pin through. 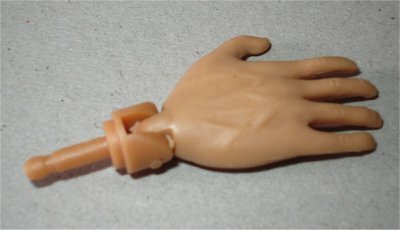 To complete this page, this shows how the DiD hand is put into the DML wrist joint, again it is similar to the instructions above. 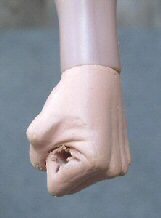 The difference here is that you have to push and hold the hand into the wrist joint, to make sure that the holes line up. 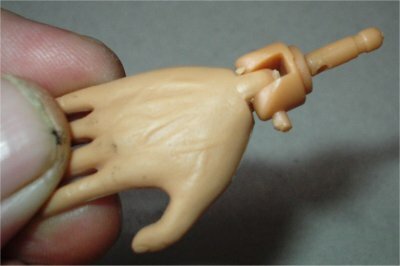 Note: Because as I have said that the DML pin is slightly bigger, you have to wriggle the hand about a bit to get the pin through the hole in the hand. 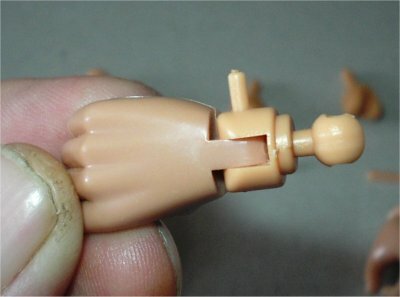 Below are the completed DiD/DML hands, and below right are the DML hands I used for my figure. 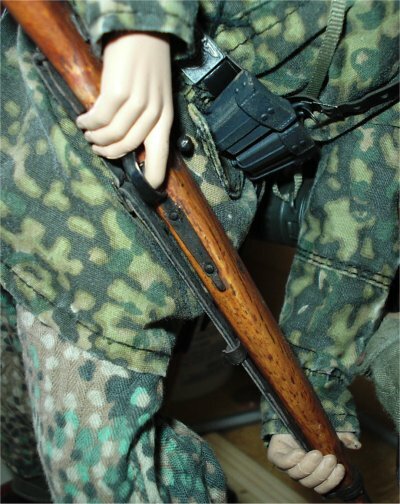 The DML hands came in very handy with my Bayonet diorama, because the DML hands on my German figure can grip the DiD rifle better which in turn helped me to get the pose I wanted. 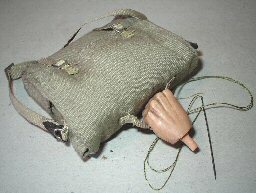 With my German Pioneer kitbash I wanted the figure to carry a bag full of explosives, I have packed it out with the blocks and padding to make it look full, but then came the problem of making it look heavy enough. 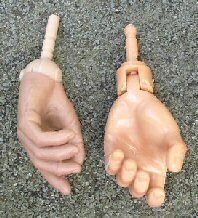 It was then that I found on eBay the fist hands as shown below left sold by Black Ash 1/6th Kit, so I decided to buy two pairs of the hands to see if I could use them. 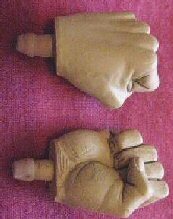 The next two pictures show how the fist hand compares to the DiD hand I was going to use. 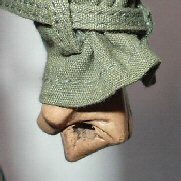 The only three problems that I found I had were firstly the peg for the arm had to have the wide end at the top sanded so that the peg is straight, a hole had to be very carefully drilled in the fist so it could hold the bag strap. 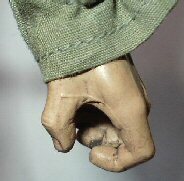 And both the fist and the other DiD hand had to be painted with some Flesh acrylic paint, so that they both match. Plus they both had to have a Brown pastel wash applied to them. 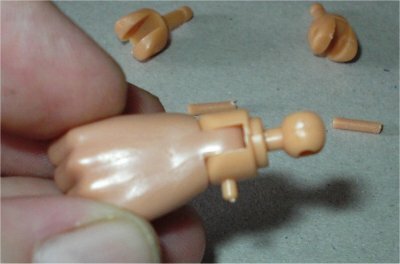 These pictures are of the Soldier Story figure that I have just received, and how I have tried to see how the Dragon hands would work with this body. And I was pleasantly surprised to see as shown above left, that the Dragon wrist pin is almost the same size as the Soldier Story wrist pin. In the two pictures in the middle above, these show a Dragon wrist pin connected to a DiD hand, which has been fitted to the Soldier Story wrist. 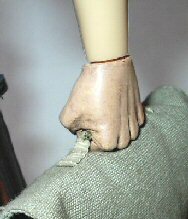 The final picture above right, shows the fist hand fitted to the wrist joint.